Swept from the Academy Cigar Store at the comer of North Centre and Frederick streets when the tremendous force of the current sweeping down Centre street broke the plate glass windows at 10 o'clock last night, Charles S. Brant, 643 Bedford street, was miraculously saved from death when the current tossed him into a comparatively calm area of water at the entrance to Holtzman's Drugstore and persons on the second floor rescued him by means of rope. 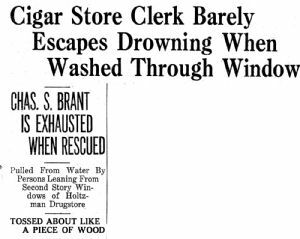 Brant, a clerk, was marooned with Howard Chaney, proprietor, and two others who remained in the store to transfer merchandise to the higher shelves. When the five or six foot wall of rushing water broke the Frederick street window, Brant was caught in the irresistible current and carried through broken glass, which badly cut his hands as he grabbed for safety. James W. Rexroad attempted to hold him but the current took him down Centre street, tossing him about like a chip of wood. "I felt I was gone," Mr. Brant said today in Allegany Hospital where he is being treated for exposure and minor cuts, "when I suddenly found myself in still water. The current at the corner of Baltimore and Centre streets divided just enough as some of the water turned into the main street, to throw me into the corner entrance of Holtzman's Drugstore. I got to my feet and was waist deep in water, but anything was better than the terrible torrent on Centre street." Pounding on the door and calling for help, Brant was not heard until some of those marooned upstairs came down to see the condition of the storeroom. They heard his cries but could not open the barricaded door. Returning upstairs, the men dropped a rope to Brant who tied it around his waist, and was thus pulled to safety. Suffering from shock, exposure and minor cuts and bruises, the man was divested of his wet clothes and wrapped in an assortment of sweaters, women's coats and overalls, until public safety employees were able to get him through subsiding water at 7 o'clock this morning, into an ambulance and to Allegany Hospital.